WebAnim8r is a powerful animation package for creating banners and graphics for websites. Not only can it create animated GIF images, but its flexible script language can help you automate static sprite or icon creation, allowing you to quickly change parameters in order to see immediately what applying different effects will have. WebAnim8r currently supports over 90 (and growing all the time it's in development!) different keywords in order to provide a great flexibility in creating customised scripts. A comprehensive user interface allows control of the major facilities without even needing to know what's 'under the bonnet'. However, the added power of WebAnim8r's scripting language provides more overall control for advanced users. Comprehensive front-end, to simplify the design of your animation. Create animations of any size. Create and edit individual frames. Ability to create bar, line and scatter charts from CSV files. Script language can be extended by adding your own keyword scripts. Automatically calls !InterGIF to create the final GIF image. Extendible utility library to simplify complex calculations. Export individual frames as Sprite files. Complex shapes and algorithms can be called with a simple, single keyword, such as 'Cog', 'Star', 'Bugwalk' and 'Shape' etc. Most keywords accept multiple parameters, for maximum flexibility. Sensible 'default' parameters if you opt to use the keyword on its own. Over 1000 built-in variable names available to use. Import your own sprites and/or Draw files. Draw files can be automatically re-positioned or scaled to suite. Ongoing development and technical support via email and mailing list. Frames may have a transparency channel. Insert coordinates automatically via point and click on the image viewer window. Combine scripts to form new keywords, building into an expandable library. Comprehensive StrongHelp reference manual with details of all keywords. WebAnim8r forms part of my growing range of tools for making web design easier. The internet is one area lots of people are interested in at the moment, and I'm always developing tools to make life easier for RISC OS based web designers - such as utilities for automating time consuming or repetitive tasks. Users of WebAnim8r might also be interested in WebGallery, for automatically creating online photo galleries from directories of images or Webworkz, for converting Fireworkz spreadsheet files into HTML pages, but if you have any suggestions for future applications please contact me as I'm always looking for ideas for new programming projects. 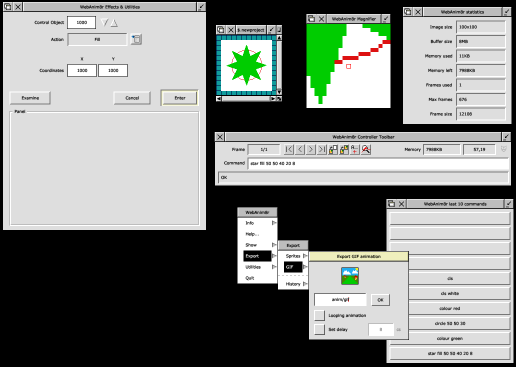 Showing many of the main windows, such as the frame viewer window, the magnifier, command toolbar window and last commands window. Additionally a window showing the values of current variables is available. WebAnim8r doesn't have to be used for only animations. Its powerful script language lets you create custom sprites or icons, such as 3D buttons. This allows you to automate lengthy processes such as changing the colours on icons. You can simply select any colour you require. You can import CSV files in order to create bar, line or scatter graphs, with customisable scaling, colours and 'point markers' (small squares shown here). You can build your own commands via completed scripts. For example, a script to draw a tree can be assigned to the new keyword, TREE - which in turn can be called with up to eight parameters, just like other commands, so that you can draw a tree (for example) in your other scripts via just one command, specifying position and size etc. with standard parameters. A new TELETEXT keyword allows you to directly plot teletext graphics characters (faithfully representing the correct character codes mapped onto the 2x3 grid) so you can reproduce (and animate) retro-style Micronet, Prestel and Teletext style graphics. Samp supports the quick generation of sprite sequences which can then be used to produce an animated GIF. A few special effect functions are built in along with useful general purpose sprite manipulation functions. Click here to view a detailed history of WebAnim8r versions.